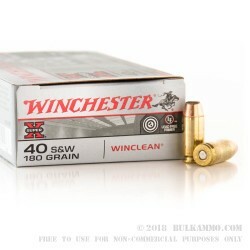 Reduce lead fouling with this .40 S&W Winclean load from Winchester! Cleaning guns might be the worst part of shooting. There’s nothing fun about trying to scrub lead fouling out of a barrel. That’s why Winchester introduced their Winclean line, which uses a brass encased base on the bullet. Where traditional rounds have an exposed lead base, the Winclean flips that and covers the lead base of the bullet in copper. Doing this reduces lead fouling in the barrel and the amount of lead particulate in the air, making it safer for barrels and safer for people too. 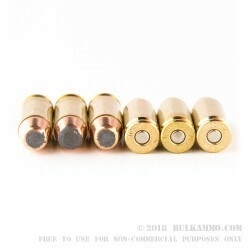 The .40 S&W round was the darling of law enforcement agencies for 20 years, and is still issued to countless cops and deputies around the country. The Winclean round allows more practice with ammo loaded to the same specification as duty ammo, but reduces clean up time and the health hazards associated with extended training. 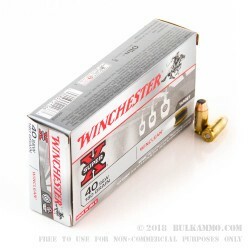 Winchester loads their .40 S&W Winclean in boxer primed, new brass cases. 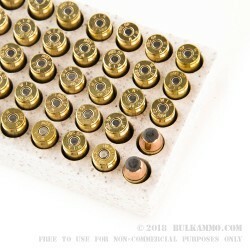 These are sold in boxes of 50 rounds each.